Designed for Raymax Infrared and Raylux White-Light illuminators, Adaptive Illumination allows the installer to adjust the light projection from a single unit to fit the specific demands of any installation. Adjustment is quick and convenient and any light angle is easily selectable. Adaptive Illumination is patent pending technology available exclusively from Raytec. 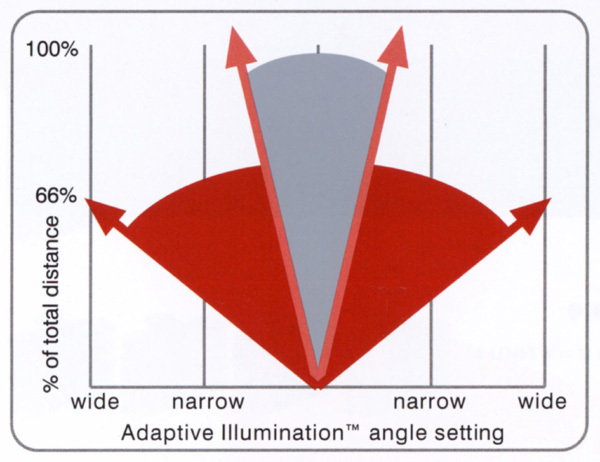 Adaptive Illumination helps to provide evenly distributed light. Standard fixed illuminators provide a peak light source at the centre of the image and the light intensity tails off to the left and the right of the centre as the light has to travel further to the target and back. Adaptive Illumination minimises lighting variances in the scene by removing the central peak of light and moving the peak light points towards the outside of the image (areas where the light needs to be more intense as the light travels further to the target and back to the camera).